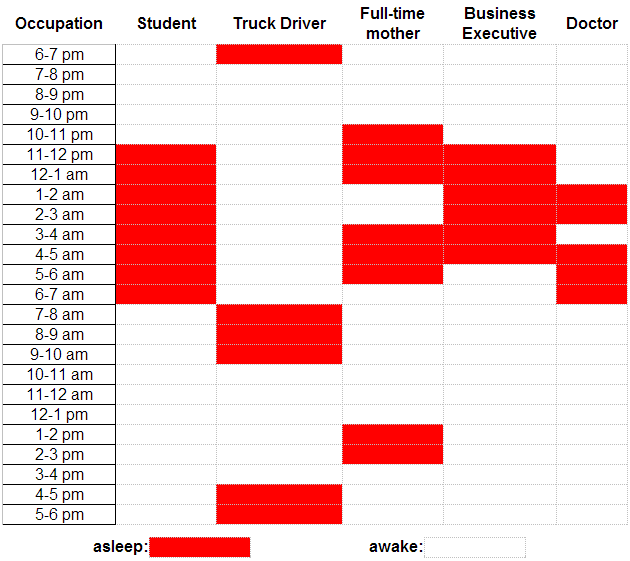 The chart below shows the sleep patterns of people in five different occupations according to a Canadian study. Differences in sleep patterns appear to reflect differences in individuals' occupations. A Canadian study has pointed out, for example, that students typically sleep for a consecutive 8-hour period each night, from 11 p.m. to 7 a.m. This may be because the central activity in their lives, study, takes place in normal daylight hours. Similarly, business executives sleep consecutive hours, but perhaps because their jobs are especially busy and stressful they sleep for 6 hours on average, getting up around 5 a.m.
By contrast, truck drivers, probably because of their need to keep their trucks on the road over long periods, tend to sleep in two 3-hour blocks: one between 7 and 10 a.m. and another from 4 to 7 p.m. Another occupation associated with broken sleep schedules is that of doctors. They tend to retire to bed around 1 a.m. and start their day at 7 a.m., but may be woken up to deal with emergencies in the middle of the night. Finally, full-time mothers, especially those with young children, tend to sleep when their babies do. Typically, they will sleep from 10 p.m. and be awoken at 1 a.m. to comfort their babies for a couple of hours. They then go back to bed to wake at 6 a.m., but nap for two hours or so in the early afternoon. Thus the influence on one's sleep pattern is worthy of consideration when choosing an occupation.